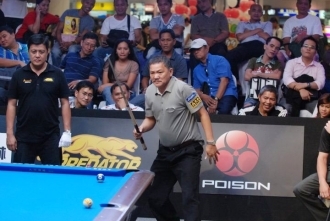 THERE’S more than meets the eye in the latest international flop featuring the favorite Philippine billiards tandem of Efren “Bata” Reyes and Francisco “Django” Bustamante. Bata and Django, after having scored two promising if not truly startling wins, next suffered an incredible fold-up that made it appear as though their fall had been plotted in advance. Of course, it was not part of the script that Bata and Django would not figure prominently in the international sports theater, the hottest hereabouts over the weekend. In fact, the promise of a battle royale materialized early once the celebrated PH tandem came face-to-face with Finland’s Mika Immonen Pitri Makkonen on Saturday. A fruitful result would’ve shoved the Pinoy tandem into the semifinals of the World Cup of Pool championship. Sorry, both Bata and Django were a no-show. They did not lose their way to the Robinson’s place around Ermita. But the 9-5 sinking they suffered against Finland made even loyal fans start to wonder if they should’ve been ranked at all in the prestigious series. Actually, pool devotees who have been lured by Bata’s sparkling world exploits into the game, showed up in full force. These same intrepid throngs conveniently shunned the recent misadventures of Bata and Django in the international pool stage. There was not the slightest hint of impending disaster. There was also no reason to suspect they did not prepare seriously for the event; although there was information that Reyes had lost as much as P77,000 in a special duel at Marlon Manalo’s parlor in Mandaluyong City on the eve of the World Cup opening. So when was the last time Bata Reyes, winner of the 1999 World Pool League, had a truly memorable performance, the sort that helped get the Philippines to be regarded as the epicenter of world pool? Is he now truly, irrevocably over the hill? Bata, 59, would not offer a hint on how many more good games are left in him, if there still are any. But one thing truly good about Bata Reyes emanates from honest humility. The man happens to be his own great critic. He never hesitates to admit mistakes. He was not exactly mad at himself for playing hideously at a time when his magical sharpness was needed most. But the legendary world pool magician has promised to quit the international circuit starting next year. He loves Philippine sports as much as he does the national flag, he won’t be around inflicting sentimental pain on his countrymen indefinitely. Truth is there’s more than meets the eye behind the sickening slip in Bata’s worth and sharpness. There’s one very reliable expert advice which said Bata had suffered an uncorrectable eye defect. One eye special, an Indian national who serviced Inquirer employees during the annual check-up last year, said Bata had to pay with his inborn magical vision after he undertook a laser operation. This expert said it would be impossible for Bata to regain the original “ambience” in his vision after it had been altered by modern medical techniques. It was a losing gamble Bata took with his magical vision that had lighted and guided his many gritty gut-feel triumphs in the past. The eye expert said Bata’s only chance is for a miracle to restore the magic.